Reinforcement is a stimulus that follows and is depending upon a behavior and increase the probability of a behavior being repeated. Likewise for the kids with communication disorders; if we reinforce the child for a positive response (even though it is a small change or response); they will be motivated and will increase that response thus we can improve their positive response by rewarding a reinforcement on time. 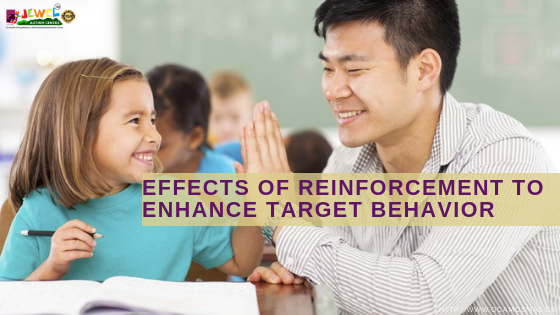 Reinforcement should be delivered within 30 seconds after the child’s positive or desired response or behaviour. Negative reinforcement occurs when a certain stimulus is removed after a particular behaviour is exhibited. The likelihood of the particular behaviour occurring again in the future is increased because of removing or avoiding the negative consequences. To reduce a behavior we can use negative reinforcement. Positive reinforcement is generally the most effective behaviour management strategy in dealing with challenging behaviors of children with ASD. It helps autistic children to learn new behavior from life skills through to alternatives to repetitive behaviors. Always pair edible, social or toy reinforcements with verbal praise. Should deliver the reinforcement within 30 sec for the positive response. In care of autism if a child is asked to point to a tree, and then points correctly to the tree, he will immediately receive a reinforce (hug, candy, star). This will result in the chid correctly pointing to the tree more often when someone asked him to point to a tree. Once a child can point consistently to the tree, he can be asked to point to a flower or bird. Slowly, you can build up the child’s repository of knowledge. Positive reinforcement opens the door to functional skills and academic learning.